The City of Moreno Valley is celebrating the Fourth of July with a hometown parade, Family FunFest and Fireworks Spectacular on Tuesday, July 4 - and you're invited! Thousands of Moreno Valley residents and visitors are expected to line the sidewalks to watch dozens of floats, community organizations, musical groups and local dignitaries make their way down the parade route. This year's Fourth of July Parade, "Sweet Land of Liberty,” begins at 9:30 a.m. on Frederick Street at Alessandro Boulevard and ends at Town Gate Plaza. Enjoy live music, delicious food, and a wide variety of vendors at Family FunFest at Morrison Park and Mountain View Middle School. Gates open at 2 p.m. The bands take the stage beginning at 4 p.m. 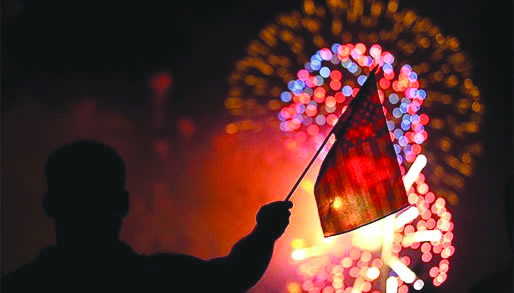 The Fireworks Spectacular kicks off at 9 p.m., synched to patriotic music on radio station KOLA 99.9. Entrance to Family FunFest is free before 4 p.m., and $3 per person after 4 p.m.
For more information visit the City's website, www.moval.org. The City's Fourth of July events are sponsored by Skechers, Waste Management, Les Schwab Tire Center, Duke Realty and The Sares-Regis Group. The City of Moreno Valley reminds residents and visitors that personal use of fireworks is illegal. You may not sell, purchase, transport, store, or use fireworks in the City of Moreno Valley or in Riverside County. Several cities in the region allow the sale and use of State Fire Marshal approved “Safe and Sane” fireworks. Fireworks purchased in these cities may not be transported, used or possessed outside of those city limits. To report illegal fireworks please call the Moreno Valley Police Department at 951-247-8700. Looking for a safe environment to enjoy fireworks with your loved ones? 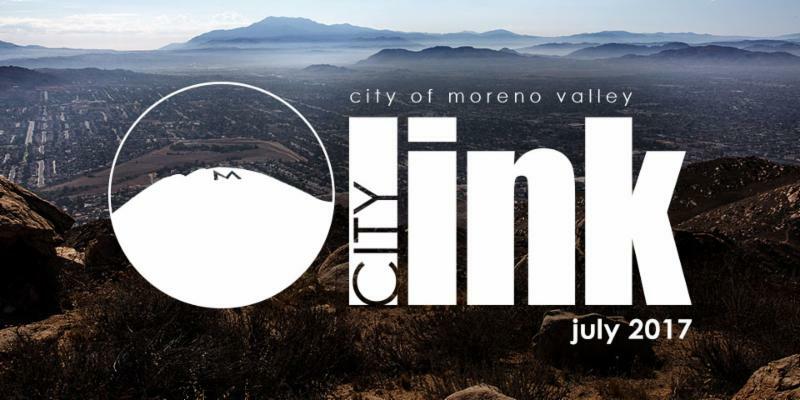 Please visit www.moval.org/fourth for details regarding the City of Moreno Valley’s Fourth of July festivities. Propane and charcoal barbeque grills should only be used outdoors. Place grills away from the home, deck railings and away from eaves or overhanging branches. Do not wear loose clothing and watching for dangling apron strings. Keep children and your pets away from the cooking area. Remember to clean the grill regularly by removing grease or fat buildup from the grill or trays below. Never leave the barbeque unattended. Keep a fire extinguisher within reach. Turn the propane tank on. If there is a gas leak, the propane will release bubbles around the hose. If there are bubbles, turn off the tank and check connections. Have your grill serviced by a professional before using again. If you smell gas as you’re cooking, turn off the gas tank and burners. If the leak continues, move away from the grill and call the fire department immediately. DO NOT move the grill. Never add charcoal fluid or any other flammable liquids to the fire. For electric charcoal grills, make sure to use an extension cord to keep the grill away from the home. Make sure to let the coals cool completely before disposing of them in a metal container. 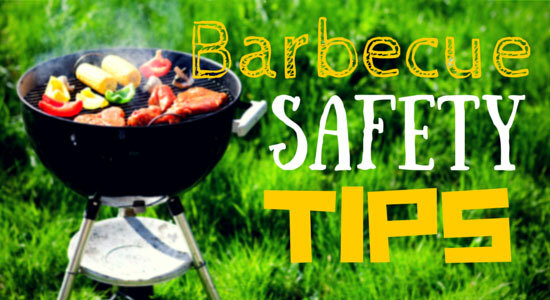 For more information please visit: http://www.nfpa.org/public-education/by-topic/outdoors-and-seasonal/grilling/grilling-safety-tips. Are you a Moreno Valley business looking to hire local grads? 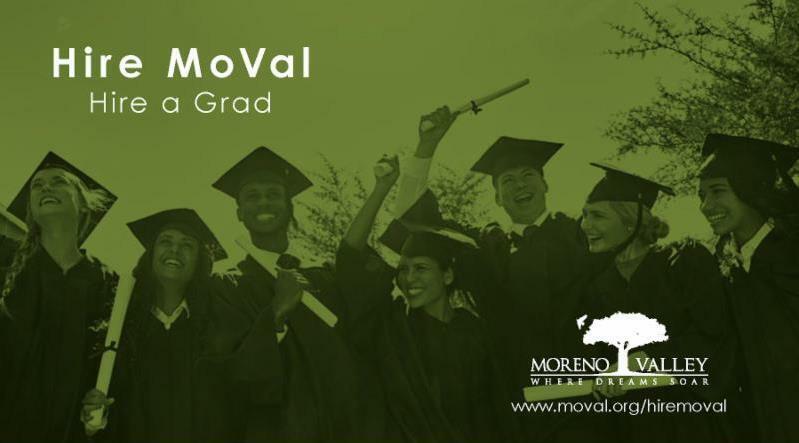 With the new Hire A MoVal Grad program, Moreno Valley businesses are eligible to receive incentives for hiring Moreno Valley residents who have recently graduated or earned a certificate from an accredited college or university or eligible program. 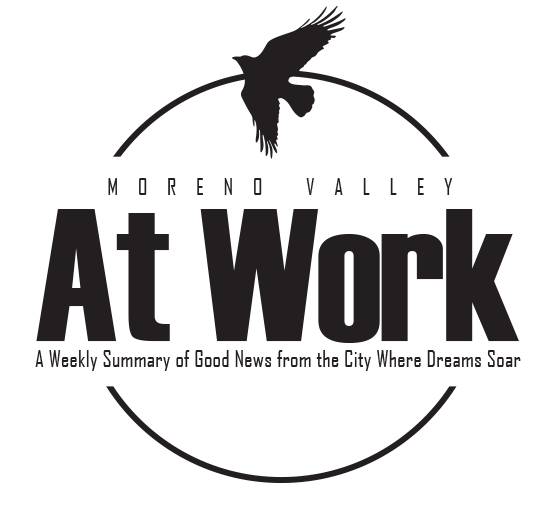 Local businesses may be awarded a $1,000 stipend for each recent Moreno Valley graduate up to a maximum of five new hires once retained for a minimum of six months at 35 hours per week. 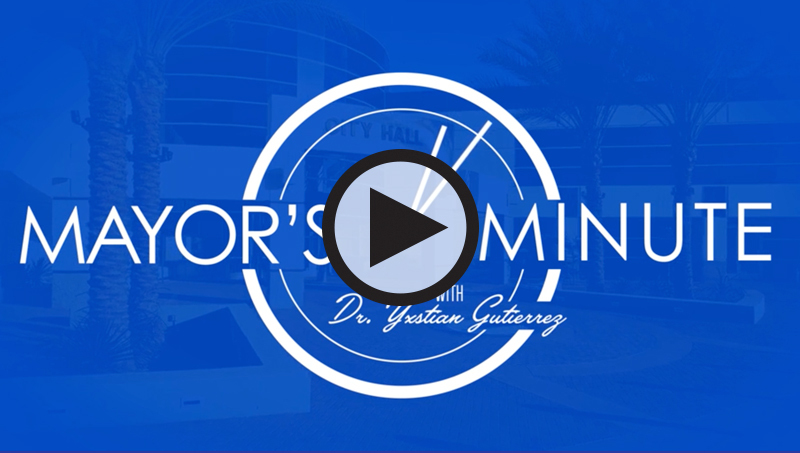 Hire a Moreno Valley resident who has received a degree from an accredited Riverside County college or university, completed a vocational educational training program from any accredited school or completed a comprehensive CTE course sequence of no less than three courses through the Riverside County Office of Education within the past two years. 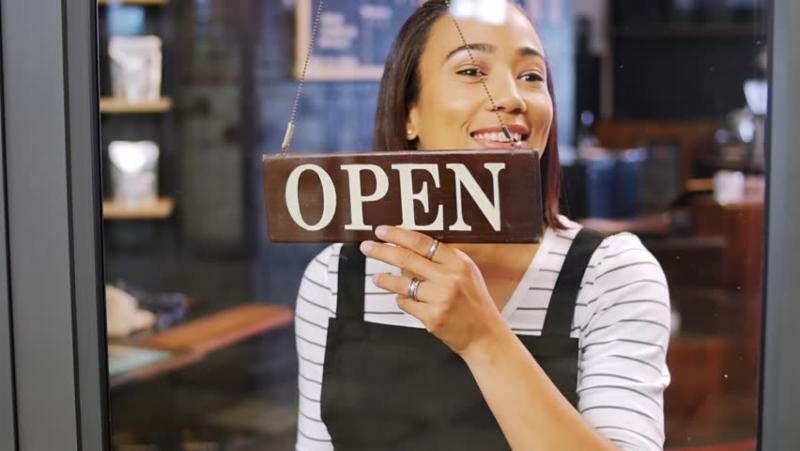 Hire A MoVal Grad is part of the award winning Hire MoVal program that provides incentives to businesses in exchange for hiring Moreno Valley residents. For more information, please email hiremoval@moval.org or call 951.413.3475 for program guidelines. JOB SEEKERS In the market for a new job? Join the Hire MoVal Job Seekers' List today! 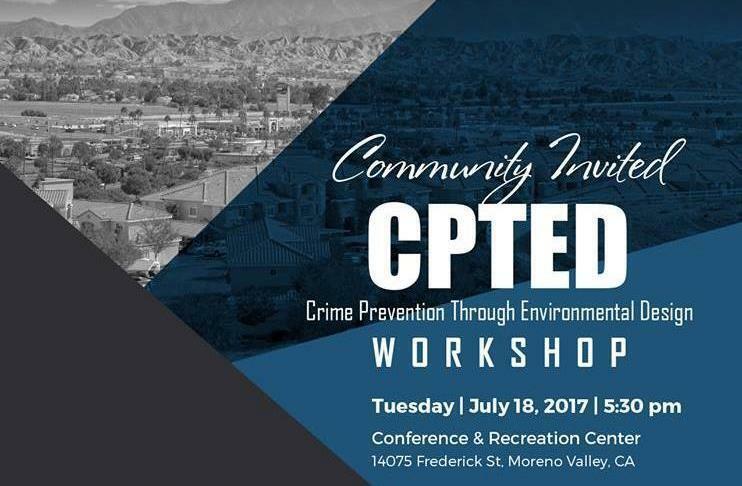 The City of Moreno Valley is hosting a free introductory workshop on Tuesday, July 18 for residents to learn how crime can be reduced through thoughtful and development. A representative from Security Design Concepts will explain Crime Prevention through Environmental Design (CPTED), which can be used to enhance our quality of life and prevent crime. This multidisciplinary approach helps deter criminal behavior by focusing on how our neighborhoods, shopping centers, parks and businesses are designed, built, maintained and used. How the space looks and feels has a significant impact on how people take pride in and ownership of that space. Community input is critical to success in putting these concepts to work. Police Department and Community Development staff with also be on hand to answer questions. Residents, business leaders and members of local civic organizations are encouraged to attend this important workshop.